As someone who's always had a relatively thick, healthy head of hair, hair loss wasn't even on my radar. I mean, sure, I knew that it was an issue many men and women contend with. But happily, I'd never had any personal dealings with it. Then a friend -- a contemporary in her thirties -- began regaling me with her thinning hair tales of woe and I learned that hair loss can hit you out of left field at pretty much any age. Swell. Something else to fret about. To get an understanding of why this happens (and keep myself from freaking out for no reason), I consulted the folks over at Nioxin. It turns out that there are many causes of hair loss, from genetics and diet to severe stress and changes in our environment. While it's normal to lose 50 to 100 individual strands of hair a day, or to lose hair after pregnancy, it's worth seeing a doctor if you experience the following: excessive dryness, flakiness or oiliness of the scalp, patchy spots of hair loss, or excessive facial or body hair. You may also, as was the case with my friend, notice a wider part, thinning on the side of the head, or a smaller ponytail than usual. Even once you've diagnosed the problem, it can take a very long time for your hair to return to its fuller state -- and for some, it never will. So what's a girl to do about styling her thinning strands? Here are some great tips from Nioxin Stylist Design Team member Diane Stevens, owner of Cole Stevens salon in Washington, D.C., and celebrity stylist Anthony Morrison from TLC's "Glam Squad: 10 Years Younger. 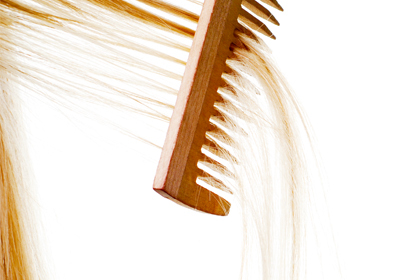 See the best ways to cut and style thinning hair now. Not as thorough as most posts. not informative at all. it is just telling us which hairstyles will suit thinning hair. i'm sorry but this article didn't help me at all!!! A few helpful tips here, but many of us are thinning at the hairline or front of the crown. We couldn't do thick bangs even if we wanted to!